Thanksgiving at my friend’s house was great. Of course we all ate more than necessary but lots of good conversation was had. 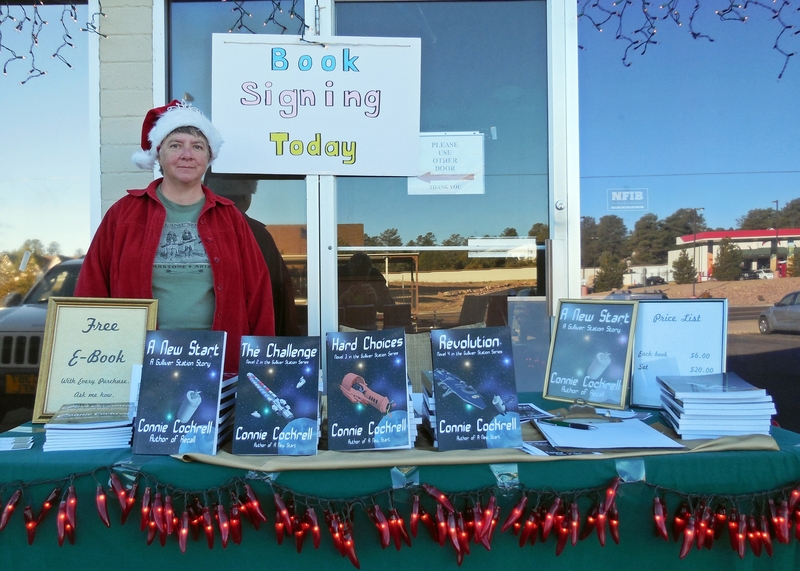 I signed books at the Swiss Village Small Business Saturday Christmas kickoff. The day started warm enough, I was in the sun. By noon the sun had moved to put my spot in the shade. It got cooler after that until at 4pm I called hubby to have him bring my winter coat. I stuck it out until 7pm. Met some nice people, sold a few books and had three people sign up for my newsletter. My NaNo book, Mystery at the Fair, finished first draft at about 52,000 words. I need to do some research and lots of rewriting and editing. It may be my March 2015 release, I’m not sure yet. My book, The Downtrodden, book two of the Brown Rain series is up on Smashwords and I’m finally got it up on Amazon, Apple and Barnes and Noble. I’m still featuring a special for newsletter recipients. Sign up for my newsletter and tell me you’d like to do a review and I’ll send you a free ebook. Go to the button on the right side of the blog or go to my Newsletter tab to sign up. Or sign up here. Use Control, Click to access the link. If you’re already a newsletter recipient and you’d like to review a copy, drop me a comment or an email and I’ll send you the secret code! No work has been done on the last two garden beds. Last week was nutso and nothing was accomplished. I did, however, manage to get my outdoor Christmas lights up on Sunday. Hubby and I will do the final connectivity today and test the timers. Yay, Christmas! I sent my Christmas cards out on Friday, day after Thanksgiving. It’s a lot easier when I’m not making the fifty or so cards I send out. Up next? Candy making and sending, interior cleaning and Christmas decorating as well as getting those garden beds cleaned up. I only decorate for Christmas so for me it’s a pretty big deal. I’ve been talking to my Mom nearly every day. Looking forward to her flying out here. Sixteen days to go! This entry was posted in Author, Book Release, Book Signing, Connie Cockrell, Every Day Life, Gardening, Holidays, My Family, Mystery, Published Books, Publishing and tagged Christmas, Connie Cockrell, Family, Gardening, Holidays, Novel, Plans by conniejean. Bookmark the permalink.